. : LuCaspeRobin + Thomas ;-) :|: Lucass' section :. - Welcome 2 the 4 of us little 1 ! Welcome 2 the 4 of us little 1 ! 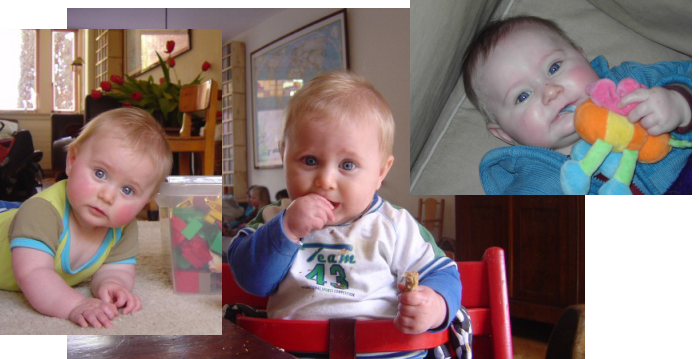 At 10 to 3 in the afternoon on this day, July 11 2005, our third son was born. We're all very happy with him, especially his two elder brothers, who hardly can leave him alone! The buzz around him constantly, shower him with kisses, hugs and caresses and only want to be close to him! On Wednesday Sebastiaan will register him at the proper authorities, together with Casper and Robin. Then we will send you his birthcard so you can get to know his three full names ;-). A tip of the veil: L.B.T. Naafs ! Test failed, kan niet overweg met diacritische tekens, newlines , tabs etc. Is ie wel XHTML compliant? Comments kunnen nu overweg met newlines en diacritische tekens. Tevens worden alle HTML-tags verwijderd. Later wil ik nog wel kijken of ik bepaalde tags wel toe ga staan voor de comments. Dan kunnen bezoekers zelf hun commentaar enigzins opmaken. Post a comment on "Welcome 2 the 4 of us little 1 !"